On 16 June, Prime Minister Antonis Samaras wrote a long opinion piece for the Sunday edition of newspaper Kathimerini (which, incidentally, was published despite the fact that all media were officially on strike) to justify his decision to shut down Greece's public broadcaster ERT. Former ERT news director Giorgos Kogiannis wrote in turn an answer to the Prime Minister on the newly established ERT workers' blog, in which he points out several contradictions between Samaras's claims and some actual facts and emphasizes that Samaras's criticism of ERT should apply, first and foremost, to his own choices and those of his entourage. 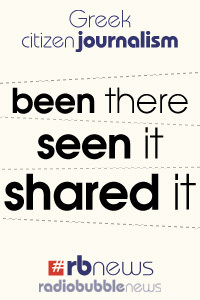 We are summarizing this indirect dialogue below. Samaras: "Is it possible to implement reforms without kicking out those who were so well ensconced in their jobs?" Giorgos Antoniou, Samaras's koumbaros , who was appointed by Samaras with a monthly salary of €3,500. Menelaos Sevastiadis, koumbaros of Samaras's communications director Giorgos Mouroutis, also appointed with a monthly salary of €3,500. Matina Retsa, who comes from the same place as Minister of Information and government spokesman Simos Kedikoglou, and who has run for office sometimes on a PASOK, sometimes on a New Democracy ticket. She received a monthly salary of €3,000, has never showed up at ERT, but does answer calls on Mr. Kedikoglou's mobile phone. Stavros Oikonomopoulos, who comes from Messinia (Samaras's constituency) and also earns a monthly salary of €3,500. Manousios Kambanelis, from Euboea (Kedikoglou's constituency), a sports trainer by profession and a party official under Kedikoglou, who was appointed to the position of office manager of ERT's executive director with a monthly salary of €3,500. Samaras: "Can we ask people to watch strongholds of lack of transparency and corruption remain undisturbed? ... The Corruption Prosecutor has ordered an investigation." The allocation of a €1 million budget to the show "Mesogeion 136", which was created to give a job to Mrs. Anthi Salagkoudi (former New Democracy candidate and daughter of former New Democracy Finance Minister Giorgos Salagkoudis), as well as other relatives of New Democracy officials who got jobs with ERT. ERT's legal department refused to sign the contract with this show's production company, a contract that was drafted by the office of news director Aimilios Liatsos [Editor's note: Liatsos was also appointed to the position of news director by the Samaras government]. The case of the show "Epta" ("Seven"), which is already under investigation for criminal impersonation: a retired journalist, friend of A. Liatsos, was recruited as the show's editor-in-chief, but because, being a pensioner, he could not receive a salary, the editor-in-chief, on paper, was his son, who was then doing his military service. The case of the owner of a well-known production company with links to New Democracy, who managed to place her son as the coordinator of ERT's programming department. The said company produces two shows for ERT. Samaras: "The Greek people are right when they ask: do you have the political will to take on the powerful and the obvious centres of waste? Or are you no different?" Kogiannis: Samaras must be referring to co-productions and external productions, which had been abolished by the previous management for reasons of transparency but re-established by the Samaras government, and which cost more than € 35 million per year. Samaras: "Privileges at ERT were well-ensconced and lack of transparency widespread." Watching the proposal being examined by a committee chaired by Samaras's koumbaros Giorgos Antoniou. Samaras: "We don't have an issue with ERT employees, several will be recruited by the new public broadcaster, but, this time, on meritocratic criteria." Kogiannis: Samaras must be referring to criteria such as those used to recruit new director Aimilios Liatsos and show host Anthi Salagkoudi, with their known objective qualities and obvious professional output. Samaras: Those who defend ERT used to say it is "manipulated". 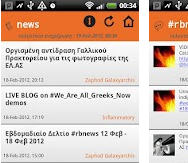 Threats received (by phone or through the internet) by Kogiannis himself, in his capacity as news director during the elections campaign, when Mouroutis was demanding to determine the order of items on the news bulletin. Kogiannis was removed from his position as soon as the New Democracy government took over. Samaras: Those who defend ERT used to say it is "discredited". Kogiannis: Samaras must be referring to the impact of his own policies at ERT. On election night, ERT had the highest viewership in Greece, at 18.5%. One year after New Democracy took over, ratings fell to approx. 4%. Samaras: "We must establish a modern and healthy broadcasting agency." Kogiannis: This is, no doubt, the reason why ERT will now not be able to participate in the tendering process for digital network providers - meaning that the sole viable bid will be submitted by DIGEA, a consortium of Greece's six largest private media groups. 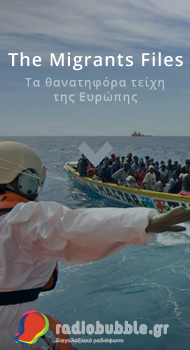 ERT produced losses of €9 million in 2009, profits of €34 million in 2010 and profits of €57 million in 2011. 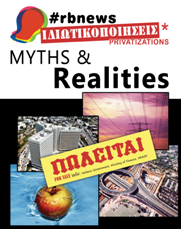 In 2012, Samaras chose to reallocate €75 million from ERT's profits to LAGIE, the Greek electricity market operator. Despite this, ERT still had a surplus of €15 million, meaning that its total profits were €90 million. 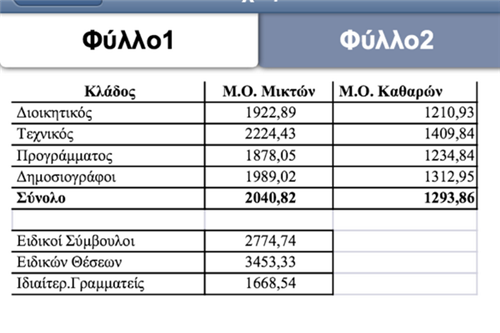 Kogiannis also put online the table pictured to the right, which gives the average salaries of permanent ERT staff (top to bottom: administrative staff, technicians, programmes staff, journalists) and those of "special" staff (i.e. political appointees - top to bottom: special advisors, special positions and personnal assistants.) The left column is gross salary while the right column is take-home pay before income tax. SYRIZA MP Rena Dourou also disseminated through Twitter this picture of the salary sheet of an unnamed central show host. 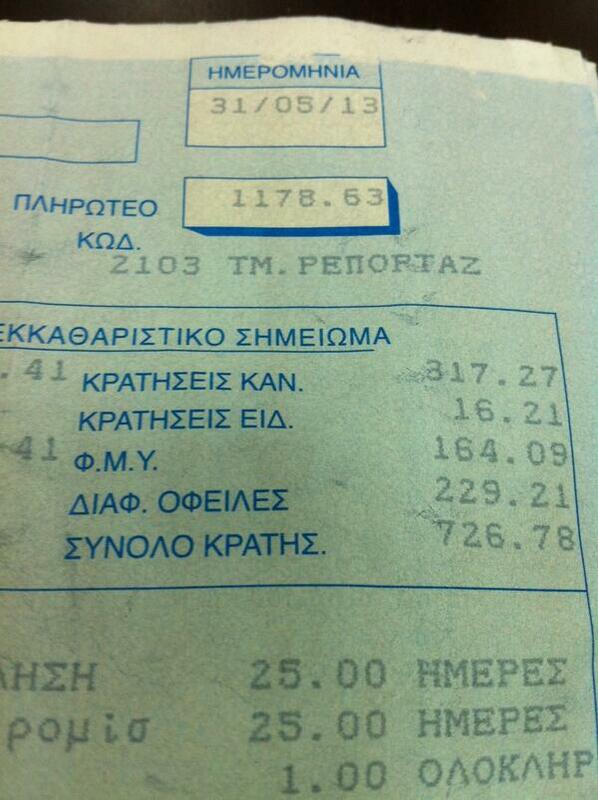 Net salary before income tax: €1,178.63. Lastly, we can note at this point that Gkikas Manalis, who was appointed by the government to the position of special administrator to liquidate ERT, also hails from Kalamata. The Greek word koumbaros literally means "best man" but can apply both ways (i.e. the person who was best man at your wedding but also the person whose best man you were at their wedding.) It can also apply to any non-relative with whom you have a near-family relationship, for instance the parent of a child you baptized, or the godfather of your nephew/niece, etc.